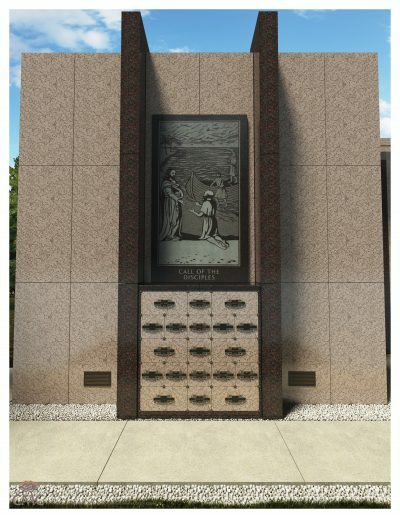 Pre-construction discounts are now available for our new niches that are being developed for the placement of cremated remains, at Holy Cross Cemetery & Mausoleum in Mays Landing. Pre-construction discounts will be available until the niches are installed and ready for use. These niches are being installed below the existing features showing spiritual images reflecting the life of our Savior, Jesus Christ. We anticipate the new niches will be available for use by the end of September. These niches will consist of single and companion niches, allowing for one or two inurnments. We offer paid in full discounts or interest free monthly payment plans. Many options are available to meet your needs. Many benefits are available when pre-planning your Catholic burial. Not only do you eliminate unnecessary stress on your loved ones during a time of emotional despair, you also gain peace of mind knowing you have allowed your family to focus more clearly on honoring and celebrating your life. Additionally, your loved ones will not need to make decisions in haste without you. Plus, you have the best selection because the greatest number of choices and options is available. Many families prefer to be buried close to or near other family members or friends. Choosing your location before others provides the greatest selection and chance that you will be close to family or friends. For more information, please call 855-MyPrePlan (855-697-7375).